This magnificent Victorian house combines the character and charm of period features with comfortable and spacious accommodation for a large group. 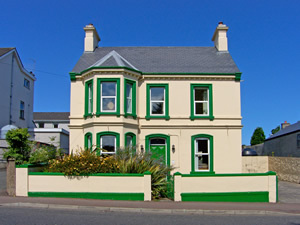 The house occupies a prime location just 600 yards from the beach in the pretty seaside town of Ballycastle within a short walk of restaurants shops and bars. It is right at the heart of the Causeway Coast, an area of outstanding natural beauty.Shop. Pub 400 yards. Beach 600 yards. GF: lounge, kitchen/diner, 2nd lounge, double with ensuite shower room, w.c. FF: 2 doubles 1 with ensuite shower room, twin, child bunk ( and 2 single beds), bathroom with shower over bath, w.c.Electricity and oil central heating included, open fire with starter pack, linen and towels included, No Smoking, electric fire, cot, high chair, stair gate, TV, dvd player, radio, CD, freezer, microwave, dishwasher, w/machine, dryer, ipod docking station, internet access, hairdryer, alarm clock, welcome pack, fully enclosed garden, patio area, garden furniture, bbq, private off road parking. Sorry no pets.